Origami Paper → Double-Sided Origami Paper → Origami Paper Pack - SINGLE SIDED POLKA DOT - 6"
Polka dot origami paper provides colorful fun to paper foldings. Each sheet of origami paper provides a colorful dot pattern with a white reverse. 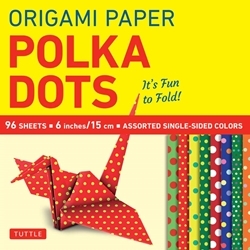 This fun origami paper provides bright colors and polka dot patterns to paper foldings. Each sheet of origami paper provides a colorful polka dot pattern. The reverse sports traditional white. This origami pack provides 8 different color patterns across 96 sheets of 6" paper.